Mid-Continent Mfg. (MCM) was established in 1986 as a manufacturer and distributor of industrial engine and compressor parts for the Oil & Gas, Marine, Railroad and Power Generation markets. Our excellent products, combined with superior customer service, have enabled MCM to become one of the premier engine and compressor parts suppliers in the United States. 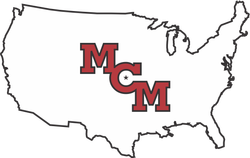 Located in Wichita, KS, USA, MCM has a 34,000 square foot facility. MCM offers in-house Cylinder Head repair, Fuel Injection repair, Gasket manufacturing, Valve Guide manufacturing, and Air start and Gas valve repair. Through our extensive vendor network MCM can provide quality repair for Power Cylinders, Compressor Cylinders, Pistons, Rods, Crankshafts, Camshafts, Pumps, Heat Exchangers, Turbochargers, and Blowers, as well as other components and accessories. Our range of products includes most parts required to maintain and repair large bore American made engines. We stock and supply fasteners to gaskets to bearings and rings as well as minor and major components. Whether you’re doing preventive maintenance or a major overhaul, MCM can meet your requirements. Mid-Continent Mfg. strives to supply our customers with the highest quality products and serve our customers with honest business practices and superior service.